If you know what medicines you need to buy and would rather just pay for them than wait for it to be prepared when you get to a pharmacy, then the Watsons Same Day Call & Pick-up service is ideal for you. 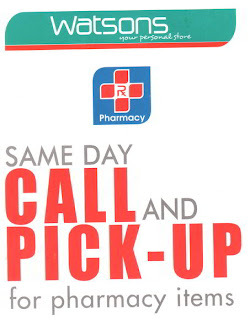 Watsons Pharmacy provides a call and pick-up service so you can just call them up beforehand and give your list of medicines and other pharmacy items. Watsons will prepare your order and will notify you when it is ready for pickup. That way, you don't have to wait when you get there. All you need to do is mention your order (and perhaps show a valid ID for verification) and pay for your order. This is convenient especially for those who order lots of different medicine. Watsons branch at SM City Marikina offers this service. Just call 477-1772 to inquire and order.